Whether you are a professional singer, speaker, teacher, lawyer, DJ, clergy, auctioneer, tour guide or sales person, caring for your voice is THE MOST IMPORTANT thing you can do in your life. 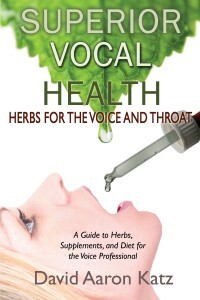 This book is your complete and one stop guide to take care of your voice naturally without drugs. 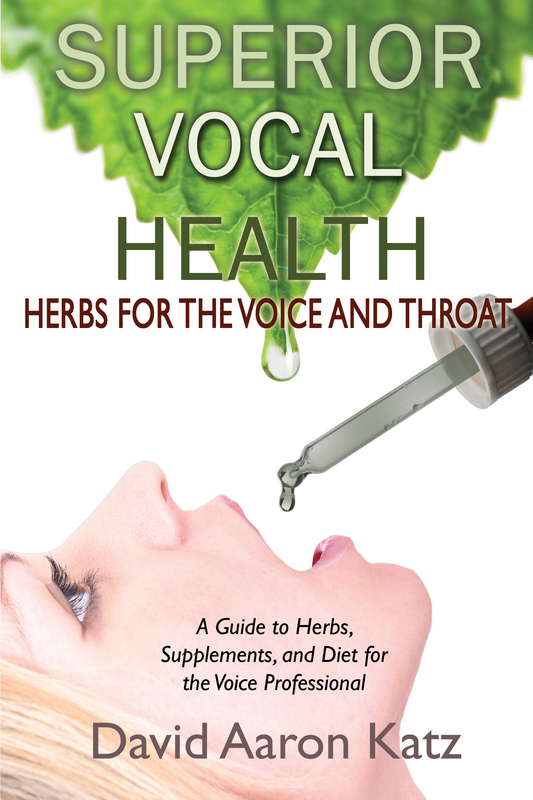 As a voice actor, podcaster, and singer, I was really excited when the folks at Pump Up Your Book offered me a copy of Superior Vocal Health: Herbs for the Voice and Throat, to review. After all, cider vinegar hot toddies and Throat Coat tea will only take you so far. At just over 100 pages, you might think this book was too slim to matter. You might even start leafing through it and think any old herbal would give you the same information. On both counts, you would be mistaken. First, David Aaron Katz has collected a comprehensive list of herbs meant not only to keep the throat in optimum condition, but also to boost energy, fend off illness, and generally improve your well-being. Second, he has included a selection of “recipes” for different herbal infusions meant to target specific issues. Third, he offers a list of “quick fix” suggestions, for when you wake up essentially voiceless and filled with phlegm. Any ONE of those things would make Superior Vocal Health worth buying and reading, but having them all in once place makes this book an invaluable resource for anyone who uses their voice for more than just talking. Even better, however, is that Katz presents this information in the friendly tone of someone who knows first-hand the things that singers, professional speakers, and actors go through – because he is one – rather than a dry, dull textbook-y style. While this is NOT the kind of book one would typically read from cover to cover, it IS a well-written, well-researched resource, and one I’m happy to have learned from. Goes well with a plate of fruit, and a mug of mint tea with honey and lemon. Pump Up Your Book and David Aaron Katz are teaming up to give you a chance to win a some great prizes! Each person will enter this giveaway by liking, following, subscribing and tweeting about this giveaway through the Rafflecopter form placed on blogs throughout the tour. If your blog isn’t set up to accept the form, we offer another way for you to participate by having people comment on your blog then directing them to where they can fill out the form to gain more entries. This promotion will run from August 5 – October 31. The winner will be chosen randomly by Rafflecopter, contacted by email and announced on November 1, 2013. Everyone who participates in the Superior Vocal Health virtual book tour is eligible to enter and win. 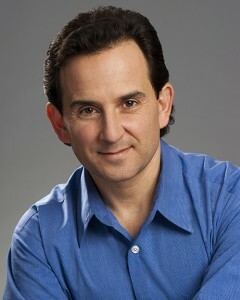 David Aaron Katz is a professional Opera singer, Cantor, Nutritional Consultant, Herbalist, Head of the Vocal Faculty for the Bronx Defenders Training Academy and CEO of Superior Vocal Health.com. His life mission is to help Voice Professionals from around the world to learn how to heal, maintain and strengthen their voices naturally without chemical or drugs.